Marmite is the one British food that I can’t live without and I always bring some back with me. It is probably the one foodstuff that I eat most frequently and the one that I never grow tired of. I could buy some here, in a tiny jar, but it is ridiculously expensive and for some illogical reason it seems wrong. I will relent though, I can’t wait until Christmas. The last two jars I had were supplied by friends. Ed brought me a huge jar back after christmas and Helen sent me the special champagne edition for valentines day. Most americans have never heard of marmite, athough you can buy it in the ‘ethinic’ food section in the grocery store. Yes, my fellow Brits, here we have our own ethnic section with shortbread, ambrosia custard, tetleys and the like. It is quite surreal. But back to marmite. For the uninitiated, Marmite is a yeast extract, which looks like thick molasses. It is savory and tastes very salty. It is similar to an Australian product called Vegemite, but in my opinion far superior. It has more flavor and is darker in color. Marmite is a by product of the brewing industry, is vegetarian, high in vitamin B and should be used sparingly. It comes in an iconic jar with a bright yellow lid. Most people don’t like it when they try it for the first time as adults, but in England it is very common for children to eat…. and if you grew up eating it, you love it. It is definitely a love hate product (they build whole advertising campaigns around the fact) and it does not elicite moderate reactions. As the adage goes ‘you either love it or hate it’. I adore it on toast but also eat marmite sandwiches and sometimes eat it straight off my finger. It is often made into marmite soldiers – strips of toast that are dunked into a soft boiled egg. It also goes very well with cheddar cheese and rice cakes and also in cheese toasties. My father eats it on baked potatoes but he is the only person I know who does. You can also make hot drinks with it, or use in cooking (instead of stock cubes). I was even given a marmite cookbook and there are some wierd and wonderful recipes involving marmite. I think even I would draw the line at a marmite, peanut butter and pastrami sandwich. 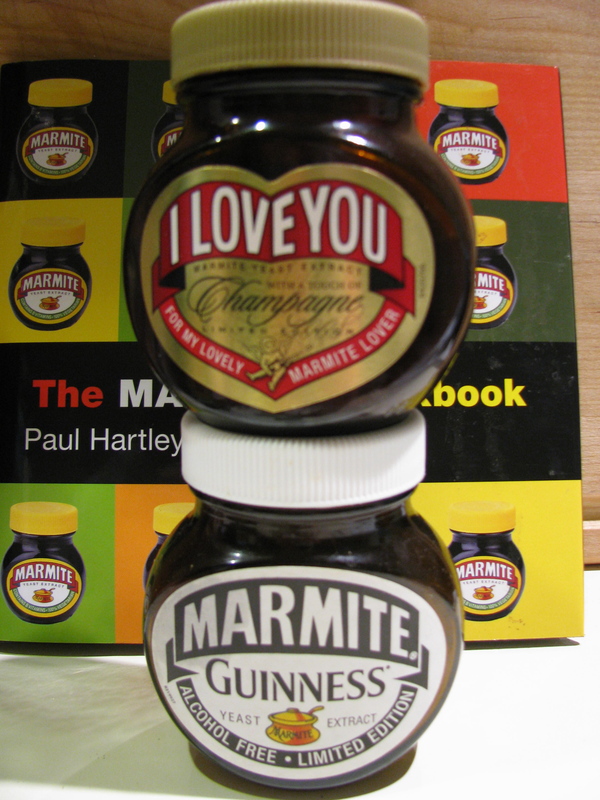 Recently there have been marmite innovations – the squeezy marmite jar, which is great until you get near the end and the limited edition Guiness and Champagne marmites. They really do taste different. 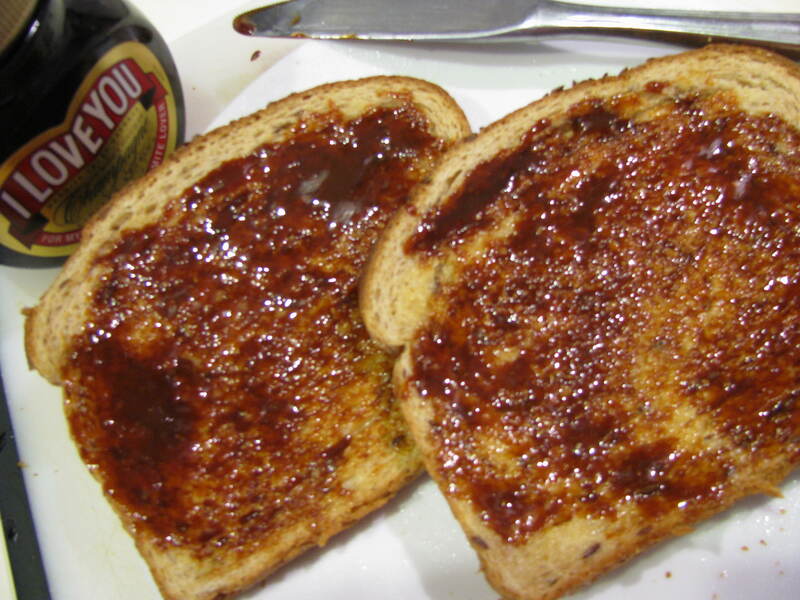 Now over 100 years old, Marmite has a cult following (try googling it!) I had never seen the Paddington Bear Marmite advert – been away from England too long! If you do like marmite, you should probably try twiglets! They aren’t made by marmite but taste very similar. You can get quite a few marmite flavored foods such as marmite flavored cheddar, marmite crisps and marmite biscuits (crackers). I wasn’t a fan of the biscuits, something not quite right about the texture and you couldn’t really taste the marmite enough. The latest Marmite innovations are Marmite flavored cashews and marmite rice cakes, which are so good that even marmite haters will eat them. I am also smitten with my new Marmite coasters and coveting some of the other items in the Marmite shop. In this month’s issue, the interviewee is Tom Daley, the 14 year old Olympic diver. He quite likes Marmite and usually has it on toast.